Ms Yvonne holds a Bachelor’s degree in Biology/Zoology and Conservation from National University of Rwanda. 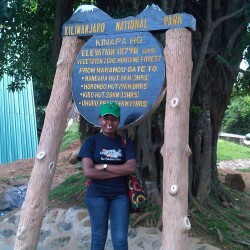 She assisted in different researches studying the biological diversity of the Lake Kivu Islands, Rwanda. She worked with Imbuto Foundation as an intern where she assisted and gave support in different projects. Yvonne also worked as learning facilitator at Digital Opportunity Trust (DOT)/Rwanda where she actively participated in the empowerment of local community in ICT, Business and livelihoods development. Ms Yvonne held key responsibilities including events organization and management, and she has been managing ARCOS Membership, Partnerships and Network programme through collaborative actions. As Executive Assistant in charge of Monitoring and Evaluation (M&E), Event Management and Membership, Ms Yvonne supports the Executive Director’s day-to-day administrative needs and organizational duties to achieve the overall goals and mission of the Organization. Yvonne is interested in nature, interacting with people and enjoys outing with friends.